Blood-tricks based expansion for the cool Assassin class! This expansion for the Assassin base class clocks in at 6 pages, 1 page front cover, 1 page SRD, leaving us with 4 pages of content, so let’s take a look! Assassins with the sanguinity tree gain the blood pool feature upon taking the first sanguinity technique. This pool begins play with 0 points, and has a maximum capacity of thrice the assassin’s class level. Whenever a creature within 60 ft. takes damage from an ongoing bleed effect, the assassin gains 1 blood point for each point of damage taken. This pool resets upon resting. Unless I have miscounted, the pdf contains 15 different techniques, with 2 of them being passive: Off the Top, available as soon as second level, adds + 1 bleed damage to the first weapon attack executed each round, with 7th level and every 6 levels thereafter increasing that by +1. Bleed damage from this ability stacks with itself, and the ability notes a Heal DC to quench the bleeding. The second passive would be blood sense, which nets you blindsense 60 ft., but only for the purpose of detecting creatures suffering from bleed damage and objects they’re interacting with. As far as active techniques are concerned, we have e.g. “Bleed the Self” which has a presence required of 0 to 3 and nets a +1 presence change. The ability is a standard action or may be executed as a part of a full-attack action. The technique basically adds bleed that deals 1 ability score damage to an ability score that is randomly chosen each round. Interesting. Blood tithe decreases presence by 1 and requires presence 1 – 4; once more, it’s executed as an attack, providing a +2 bonus to Strength and Constitution that increases by a further +1 at 7th and 13th level. This buff ends when the target has not bled for one round or died. Upon executing this technique, you must spend blood points of up to class level, and the effect otherwise lasts for 3 + blood points spent rounds. This technique has an escalation option that modifies presence required and presence change, but if you opt for this iteration, you also penalize the target of your attack, essentially leeching the ability boosts. Bolster the Blood allows you to expend blood points to enhance a target within 30 ft., providing temporary hit points that last for a round. Due to being activated as an immediate action, it also clarifies interaction with technique per round cap. Bolster the Self is the self-only version of this one, but interestingly, it’s NOT a prerequisite for bolster the blood. Cauterize causes fire damage to a bleeding target at presence change 1, and while there is no save, this does end any ongoing bleed damage of the target. Yes, ability bleed is properly codified. Crimson Font has a range of 60 ft. and targets any number of creatures – the ability inflicts 1d3 +1 piercing damage per class level, divided however you wish among the targets within 60 ft., with a Fortitude-save to halve damage. At -4 presence change, it requires some setting up, though. For each point of piercing damage you inflict, you also inflict a bleed damage…which makes this a great combo-finisher. Enfeebling strike is easier to set up: At just a presence change of -1, enfeebling strike temporarily penalizes Strength of the target hit by 1d6, +1 per two assassin class levels, with 1 being minimum. Fortitude save halves, and the duration of the penalty is governed by the amount of blood points expended. Exsanguinate the Self nets a -4 presence change, and thus must be considered a combo finisher of sorts. You expend any number of blood points, up to class level, and inflict one point of random ability bleed damage for each blood point expended, to be distributed among any number of targets within 60 ft. A single creature can’t take more ability bleed than half the number of blood points expended, which helps make this avoid being a dragon-slayer. Fort-save negates. Make it flow is a swift action with a 60 ft. range, and causes 1 point of bleed damage, which, at 0 presence change still makes for a good kick-off. Puncturing blow changes the weapon’s base damage die to bleeding damage instead, at presence change +1. It lasts for 2 rounds, and increases twice at higher levels. Transfusion has a -1 presence change and lets you touch a creature. Expend up to assassin level blood points, then roll d8 for every blood point. The target regains hit points equal to the amount rolled, and the assassin takes a penalty to maximum hit points equal to 1/4th of the rolled amount, rounded down. This reduction ceases after resting. Transruption, which, like Transfusion, is a presence change -1, lets you bind two creatures together. Whenever one of the bound creatures takes damage of the three physical damage types, then half that damage is siphoned off to the second target. When a bound creature takes bleed damage, the second creature does take the full bleed damage as well, but unlike the physical damage dispersion, this propagation of bleed damage may be resisted with a Fortitude save. Duration is governed by blood points expended. Finally, vermillion blade, at -2 presence change, is a melee touch attack with an empty hand. On a hit, you draw a fully formed blade of blood from the target. The weapon begins at +1, and increases its potency at higher levels, allowing for the use of some weapon special abilities. There are 3 different feats included in the pdf: Blood Focus increases the maximum amount of blood points you can expend on a technique by +1. Bloodbonder Adept nets you 2/day an additional immediate action for bolster the self or bolster the blood, provided you did not perform them already this round. Odd regarding verbiage here: Does this mean that you lose an additional round worth of swift actions in the aftermath? If not, then why not simply allow for the use of these techniques sans requiring an action or building on free actions, with the appropriate not-your-turn-caveat? Anyhow, Transfuser, the final feat, nets you a transfusion pool with points equal to your assassin level. This pool acts basically as a buffer for transfusion, allowing you to expend its points instead of accepting the maximum hit point reduction that the transfusion technique usually requires. Nice one. Editing and formatting are very good on a formal and rules-language level, juggling complex and intriguing concepts. Layout adheres to Interjection games’ no-frills two-column b/w-standard, and the pdf has no bookmarks, but needs none at this length. 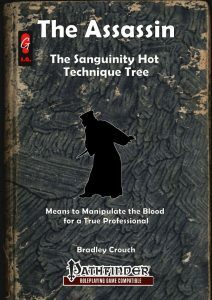 Bradley Crouch’s sanguinity tech tree is pretty cool – a blood-themed warrior angle for the assassin class? Heck yeah, why not. The concepts are varied and interesting, and there are some cool tricks here that reminded me of one of my own designs. The finishers are deadly, the minor healing welcome, and many of the attacks have neat visuals as well. All in all, an inexpensive, fun expansion well worth owning, though one that could use a sequel to build on it. The concept and theme are strong, and I couldn’t help but feel like there is more waiting in the wings here. My final verdict will clock in at 5 stars. Definitely recommended for assassin-fans! You can get this neat class expansion here on OBS for less than 2 bucks! You can get the cool momentum-based assassin-class here on OBS! Missed the compatible fabrication expansion? You can find it here! The Integration tech-tree expansion can be found here!